Mitchell has been one of my favourite authors, since the appearance of his first novel, Ghostwritten, in 1999. His works are normally quite long, over 500 pages in length, and his fans wait, I am sure impatiently, for the next book – normally we wait for between 2 and 4 years. So I was delighted to see, that barely a year after The Bone Clocks, another Mitchell had appeared. His publisher was also surprised! Mitchell never really disappoints me too much, even when inevitably some books are not as completely satisfying as others. Slade House is, I think, Mitchell at play, Mitchell inventive (as ever) – and perhaps even Mitchell showing off a little, amusing and entertaining the reader, but with enough tenderness, compassion and humanity for the reader (well, this one, at least) not to mind if he demonstrates his wonderful ability to speak in many voices, to deploy the first person narrator, to poke fun at literary conventions (and himself) and to constantly pull rugs away from under the feet of his readers, leaving them sprawling and momentarily fooled. He IS brilliant, and one of his brilliant gifts is to be able to effortlessly (it seems) glide into voicing many ages, both genders, many cultures. His characters appear from the off to have their own unique, authentic voice, and I feel as if I would know them. In Slade House, he takes an idea which underpinned The Bone Clocks and runs with it, in genre fiction – specifically Vampire Gothic. In The Bone Clocks he was exploring a kind of transmigration of souls, an immortality, across time, by wiser beings, The Horologists, and a group of humans who discovered this secret, and, in the greedy way of us, wilfully abuse it by preying on others, The Anchorites. Slade House is told through the first person voices of a succession of ‘victims’ of a nasty pair of soul vampires, rather than the pure blood sucking variety. The conceit is that the all-too-human pair, who have discovered how to be immortal through necromantic means, need to eat a soul every 9 years. So far, so fantasy genre macabre, and I have to admit, were it not Mitchell, I would not have wanted to read this. It being Mitchell, it offers the opportunity for the reader to get inside the ‘soul’ of an imaginary person through the authors facility with the first person narrator. For me, the last section was the weakest, because here is where Mitchell needs to explain certain things for the edification of those who have not read that earlier work, or may have forgotten some of the theories behind it. So, given a first person narration, he has to use the device of one person who knows everything having to give a dissertation of facts and ideas to another character – it is the equivalent to, in a crime novel, the detective laying out how the crime was solved to the denser underling – it’s a device for the reader’s benefit. Mind you, knowing Mitchell, there may also have been a conscious playfulness in this, as he is not above poking fun at himself and deconstructing his writerly devices. 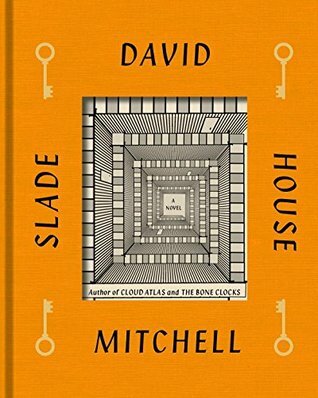 I liked this enormously, but because of Nathan’s story, though Slade House is ‘Mitchell Light’ , I have inched to 5 star. He is an author who is always best read with focus and attention, as even when he is being most flashy, most showing off his writerly ‘bling’ the reader will suddenly be dropped into playfulness with words, juggling voices and genres, pastiche, and – when you think you have this man’s measure as a sleight of hand merchant, a music-hall master only of illusion and cleverness which needs admiration (and might evoke a little envy) , he drops you down into darkness, suffering, existential terror and pain, despair, cruelty, soulfulness and all the unbearable truths that make the glitter and legerdemain necessary as a foil to the depth. The man is almost TOO clever, and I sometimes wonder if his refusal to be pigeon-holed creates a certain distrust of him, from certain quarters. He is an unpredictable writer – except that he is always an excellent one. Here, he is back to the voices of several narrators, with the linking devices of major and minor figures from previous sections of this book (or previous books) turning up as major or minor characters in later stories. So, this major theme – cheating ageing and death, the desire for immortality, – for us as individuals, or collectively as a species, is explored severally. The central, linking character who starts off the journey in 1984 is Holly Sykes, a 15 year old from Gravesend (Hah! Mitchell slyly peppers his novel with reminders, obvious and subliminal, of his themes) She is stroppy, tremblingly in first love, and full of attitude. Holly also has a younger brother aged 6, strange and wise beyond his years. At this point, Holly’s voice is pretty well normal for a 15 year old lovelorn girl with some lip and feist to her nature. BUT, there are strange incursions from a mysterious set of people who could almost have strolled in from the hinterland between the two incarnations of Mr Banks – that is Iain, and Iain M.
And these incursions do re-occur, throughout the book. Yet, it is in no way ‘magic realism’. The real is very real….and yet, reality is not quite solid, not quite fixed. Neither does this sit as science fiction, nor fantasy. Mitchell resolutely eschews the neat pigeon hole of genre. Yet he picks and weaves in genre stock in trade as he chooses. And, for my money, he does this consciously, precisely, and largely, well. Again we meet Holly, and, again there is a sustained influx of what some might call ‘fantasy supernatural elements’ Except – Mitchell reminds us that there are other cultures who take some of this quite seriously. There is a section set in Australia where Holly taps in to Aboriginal myths, Aboriginal ways of interpreting the world. This feels quite important – Mitchell himself has been castigated from some quarters for his usage of ‘fantasy’ when he is a serious literary writer. And yet….IF he had been a writer from some cultures, I have no doubt the ‘mythic culture he is writing from, would not have been dismissed. It is as if a serious twenty-first century literary writer, not a genre writer, who is British, should NOT BE DOING THIS. I riff on notions of the soul as a karmic report card; as a spiritual memory-stick in search of a corporeal hard-drive; and as a placebo we generate to cure our dread of mortality. The fifth section, set in 2025, is the one where the ‘fantasy elements’ really bite hard, with some psychic battles between the forces of good (Horologists) and bad (Anchorites) are played out, with Holly Sykes again, now in her 50s, with a grown up daughter, being played for, or being played with. Here is the section where I believe Mitchell’s risk-taking does not really quite work. Elemental battles between the forces of dark and light have of course been part of many great pieces of classical literature, but also have a tendency to reek of Komik Kuts, and I don’t think Mitchell makes a completely clean escape from the latter. The final section, Sheep’s Head, is set in 2045. Holly is in her seventies, living in rural Ireland. We are in the period of the Endarkenment, heading towards the end of days – not through any supernatural agencies, only through our own neglect, greed and wastefulness, our ‘live now and let future generations pay later’ mindset. Climate change has, as the warning voices insistently tell us, created many changes, much of the earth is uninhabitable. Elderly nuclear reactors have sprung leaks, political instability and the emergence of new power bases, the collapse of the global economy, the rise of militia, the end of taken-for-granted-endless-supplies of fossil fuels, gas and oil, and thence electricity has ended everything we take for granted. The technological advances of recent decades are gone. Mitchell presents as brilliant, bleak, and heart-breaking a future, with small lights bravely attempting to keep the kindness of humanity, still flickering, as I have ever read. People talk about the Endarkenment like our ancestors talked about the Black Death, as if it’s an act of God. But we summoned it, with every tank of oil we burnt our way through. My generation were diners stuffing ourselves senseless at the Restaurant of the Earth’s Riches knowing – while denying – that we’d be doing a runner and leaving our grandchildren a tab that can never be paid. For sure, this is not by any means a faultless book. But flawed Mitchell is a far more rewarding read, to my mind, than many writers at the absolute top of their form. Finishing this book, puts me back in the same place as every previous one of his books – other reads, will for a while feel curiously empty and lacking. Naoki Higashida was 13 when he wrote this book, a young Japanese boy with autism. Using a complicated (to my eyes) grid with Japanese characters he pointed to each one in order to indicate what he wanted to write. His focus is to explain autism from the inside, in order to let the rest of us – and presumably, most of all – those who have a child with autism, a sibling with autism, who teach children with autism – understand the supreme mismatch between what those of us who are not autistic see and mis-interpret and what people with autism feel. I came to this book because I am a great admirer of David Mitchell’s writing, and thought initially this was a book BY Mitchell, before discovering it is a book translated by Mitchell and his wife, Keiko Yoshida, and with a foreword by Mitchell, in which, with typical intensity and precision, he guides the reader into an imaginative exercise to try to help us make the jump into an inside experience of autism. And yes, I found it bewildering and terrifying, which is rather the point Mitchell wants us to realise, before Naoki Higashida eloquently explains the rich, profound, tender complexity of his interior world. What Mitchell’s foreword also reveals, again with the empathetic, compassionate humanity which is a hallmark of his writing, is that there is a back-story to this translation by Yoshida and Mitchell – they are the parents of an boy with autism. Mitchell himself invites the reader to feel humbled by Higashida – as the translator has been humbled – by being given a real understanding of how the autistic person really is, with an inner which may be even more vastly dissimilar from what the outsider SEES, than most of our structured `masks’ of who we ‘normals’ are, have dissimilarity from the inner core and rich complexity of each of ‘us’. The greatest myth we all believe about those with autism, is that they cannot feel or empathise with what `us normals’ feel, and that they lack compassion. However, this 13 year old boy, who explains that he is speaking for others also, who are diagnosed as `autistic’ shocked and humbled me by a profound and tender compassion FOR US, and for the world itself, particularly the natural world, that goes way beyond my own compassionate empathy. What is crystal clear, in this beautifully, gently explained book, is that we have failed to understand that it is not empathy that autistic people lack, it is the knowledge of the approved social forms and rituals to express this. We have (well, I have) mistaken the lack of external expression for a lack of internal feeling. I have only briefly encountered autism, when working many years ago with a child. I am pleased to see that some of my `instinctive’ feelings about how to be with that child were right, but, oh, I missed so much. Higashida who says he wants to be a writer (Mitchell, truthfully, in his foreword, says – actually, he already IS one) – uses short questions as chapter headings, with the chapter content as answers. The questions are common ones which the non-autistic might have on observing the behaviours associated with autism, for example “Why do you ask the same questions over and over” “Why do you move your arms and legs about in that awkward way”. Over and over again the insistent, but gentle plea is re-iterated by Higashida – stay with us, don’t give up on us. Interspersed with the Q and A chapters are metaphorical stories, often to do with the natural world, and what might be called, philosophical and ethically inspired soulfulness. In truth, I was left with a sense that this young boy demonstrated a far better and more compassionate understanding of the nature of true empathy than I have. He is just unable to outwardly show it in a way which I, and others like me, might understand. The book is completed with beautiful nature inspired illustrations, metaphors and abstract impressions, often using shapes and designs rather than realistic objects, to visually express a sense of the interior world. These are by “Kai and Sunny” illustrators whose work is included in the V + A’s print archive collection, who have collaborated with Alexander McQueen and whose designs feature on the covers of several of Mitchell’s books . 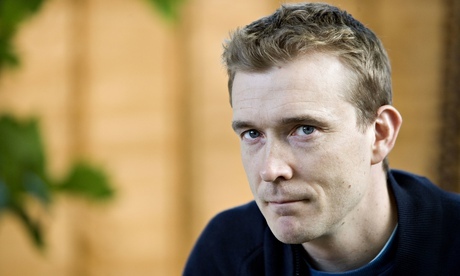 David Mitchell is a fantastic writer, continuing to display chameleon skills with every book. he can write, truthfully, with several different voices, and in several different styles. In this book published in 2006, on one level he damps down his pyrotechnics,by staying with one narrator throughout, rather than ‘linking’ different stories. What he ends up with is a book of more traditional structure, following the journey of a adolescent boy, growing up in the early 80’s in Worcestershire, with elements of the author’s own painful and often funny adolescence set against a backdrop of the Falklands War. Sometimes you come across a book which is so wonderful that reading it is as much of a sorrow as a pleasure – especially when the end of the book begins to come in sight. This offering by David Mitchell is just such a book. He really is a quite extraordinary writer, his prose is beautiful and clear, extremely well-crafted, at times poetic, without seeming forced or contrived. There is a crystalline, lucent quality to his work, and great and refined tenderness. He’s a writer with vision, intellect and heart. And a quite extraordinary ability to metamorphise into different voices – this was stunningly evident in his first book, Ghostwritten. In this, his fifth, he stays with one narration, but there are 3 major protagonists in the story; the subtlety of his writing shifts the perspective so that the reader is drawn into all three, separate, stories, and can find each character fascinating, layered and moving. The book is a kind of love story, in the fullest incarnation of what a story about love might mean. Japanese, Dutch and English culture and history collide as individual stories are unfurled. Set in an island off mainland Japan in the late 18th and early 19th century, the research which Mitchell has done must have been prodigious, though he wears his learning lightly and the reader absorbs much information without pain. There is a combination of great delicacy in the writing, and some very graphic and visceral descriptions of medical procedures, beautifully done, even though inevitably they are shocking. Towards the very end of the book, there is one chapter, the 39th, where the writing is of such assured mastery and beauty, and the narrative so profound and full, that it almost becomes impossible to imagine being able to read a book by another writer. Mitchell has exceeded all the accolades he has garnered. When I reached the end of the book I burst into tears, at an ending so right, so tender, so truthful. Apparently the book took 2 years to gestate. So I guess there may be a long wait for Mitchell no 6. Time enough to re-read his entire canon.